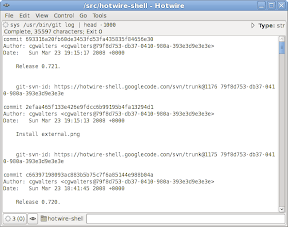 Hotwire 0.721 is now available. This release features a lot of changes since 0.710. Immediately visible will be the entirely revamped UI. 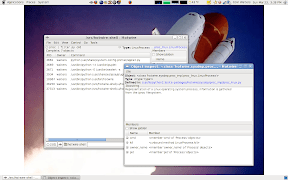 The goal is to be closer to a shell/terminal interface than before, giving more space to the output of commands while still allowing use of the mouse for operations. Another exciting internal change is that you can now define Hotwire builtins as regular Python functions, but with a decorator. For more about this feature, see this post. 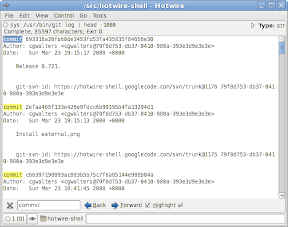 Mark Williamson has been experimenting with a set of Hotwire extensions to make Hotwire into an interactive Mercurial shell; see his site. For the detailed release email, see the announcement. This entry was tagged hotwire. Bookmark the permalink.